In the summer of 1989, Jack Moffly and four friends sailed the forty-four-foot ketch Athene across the North Atlantic, from Nova Scotia to Ireland—a rough, lonesome expanse of ocean that has swallowed many a boat and spawned many a legend. Indeed, several legends were spawned on that very trip. He might have gone back, in that moment, to the sea from whence we came. But that would have been very bad form. For one thing, his and Donna’s thirtieth wedding anniversary was nigh, and Donna had been snuck aboard for the occasion—in the form of a blow-up doll with a black nightgown and red wig approximating the real Donna’s glorious flame, and a tape recording of Donna’s voice whispering sweet nothings. Now she was waiting patiently in Jack’s bunk for him to stop fooling about in the ocean. The intrepidness, the zest for life, the bonhomie, the gentlemanly cool: These are among the many splendid qualities we shall miss about John Wesley Moffly IV. For on the morning of March 11, 2018, after ninety-one magnificent years, he set sail for the farther shore. Jack was born into a family of industrious, conservatively tempered Philadelphians on August 5, 1926. Chestnut Hill Academy and Andover launched him toward Princeton (World War II intervening: he served in the Army Air Force), where he studied at the Woodrow Wilson School of Public and International Affairs and plied the waters of Lake Carnegie as commodore of the Princeton Yacht Club. From this unpromising soil, romance blossomed. They were married six months later. The lean, patrician bearing. The courtly manner. The mellifluous baritone. The traditionalist outlook on the world. And yet: the festive bow ties. The late-staying at parties. The high color in his cheeks, the lively glint in his eye that, even in old age, revealed the eternal boy in him. Jack is best known for his terrestrial accomplishments. As Publisher, he brought in color printing and new magazines, and steered the business through the reefs of the digital age and, with Jonathan ably at the helm, past the icebergs of the Great Recession. Last year the Greenwich Chamber of Commerce awarded Jack the Malcolm S. Pray Excellence in Business Award. Jack read voraciously, especially about history and politics. Atop his nightstand at the time of his death were Ron Chernow’s biography Grant, oddly reflective of our own times, and Luke Harding’s Collusion: How Russia Helped Trump Win the White House. He was also a careful listener (all who knew him remember the hawkishly attentive eye), unless he forgot to change the batteries in his hearing aid, in which case he was sure to go along with your opinion. Though a fiscal conservative and lifelong Republican, Jack prized integrity and decency above party creed. Thus he could write in praise of Democratic Senator Chris Murphy—“a talent more important than ever in today’s contentious climate”—and be “appalled by Trump” (as Audrey noted), whose abrasive, anti-intellectual America was not Jack’s America. Jack brushed past the insults of age as if they were minor irritants. In 2005 he fit in trips to Antarctica and Barbuda before submitting to a long-scheduled angioplasty—which was followed promptly by an emergency triple bypass. One day in his mid-eighties, Jack went sailing alone aboard his thirty-foot catboat Purple Tiger. The boat was puttering across Captain Harbor on automatic pilot when Jack went on deck and yanked a line that gave way, sending him back against the lifeline—which also gave way—and into the blue-gray chop. Making matters worse, the main sheet caught round his ankle. Consider the irony: a superb sailor on far-flung seas, nearly dragged to death feet-first by his own boat in his own puddle of water. If Jack hadn’t managed to pry off his shoe, Donna says, “It would have been curtains.” Like the Atlantic mishap, this one occurred in early July. “He had a thing for wedding anniversaries,” Miles McDonald observes. 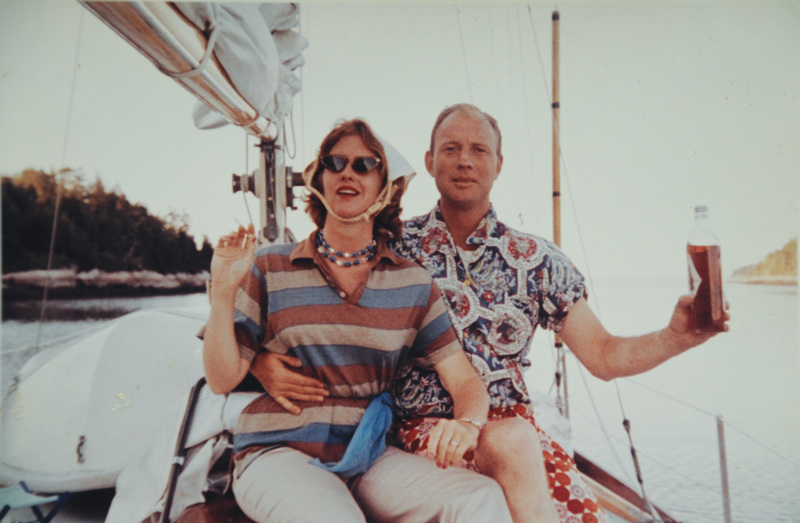 Photo Above: All dressed up for the Captain’s Dinner aboard Reindeer, Newbold Smith’s forty-three-foot sloop he was ferrying back to Northeast Harbor after the 1962 Marblehead-Halifax Race. Joanne and Wright Ferguson were part of the crew. In a reflex response to a minor fire in the galley, Wooly Henry threw the oven overboard. It was hard finding a metalsmith to pound out a new one before the owner found out.